The series was competitive from start to finish but the Huskers found just enough offense to win all three games. It was a very different pace compared to just one week ago against Purdue. Nebraska scored only 10 runs this weekend against the Nittany Lions compared to 39 against the Boilermakers. The Huskers completed the sweep in both series, showing that they have the ability to get it done in multiple ways. The pitching rotation was tweaked a little bit on Saturday, with it going Matt Waldron, Reece Eddins and Nate Fisher. This is the regular weekend trio for Nebraska, but it has usually been in a different order. Fisher typically starts Game 2 and Eddins starts Game 3, so this will be something to keep an eye on going forward. Regardless of order, the weekend trio continues to be effective. Robbie Palkert and Colby Gomes each contributed to finish the first two outings and did exactly what they were asked to do. Mike Waldron and Shay Schanaman completed Game 3 to seal the third win. The Huskers seem to be in good hands with their weekend pitchers. Nebraska came away with its third conference sweep of the season and owns the best record in the Big Ten. Let’s jump into three takeaways from the series with Penn State. When Nebraska looks back, it will see plenty of missed opportunities for more runs. The Huskers left 28 runners stranded in three games against Penn State. This has been a struggle at different times this year and it probably cost Nebraska a series win at Minnesota. 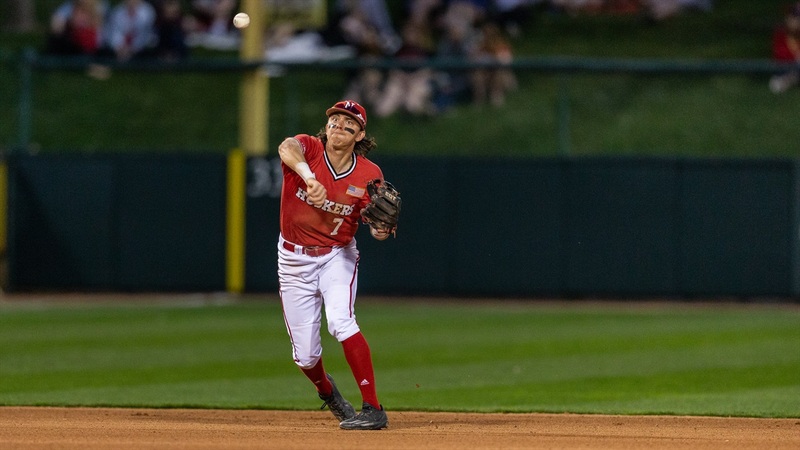 It will be important for the Huskers to convert base runners into runs to finish the season. Like mentioned earlier, the Huskers were pretty quiet offensively in all three games against Penn State. The team was able to muster just enough to complete the sweep, but it was a much different look from last weekend against Purdue. The bottom line is Nebraska found a way to walk out of State College, Pennsylvania, with three wins. It was a gritty performance and an impressive response after getting run off the field at home on Tuesday night versus Creighton. This team has shown the ability to bounce back after tough losses this season and fits the “fighter” mentality that keeps coming up. After not even making the conference tournament last year, Nebraska now sits in first place halfway through Big Ten play. Coach Darin Erstad and this team won’t show it, but it has to feel good after the painful season a year ago. The Huskers finish conference play with series against Iowa, Illinois, Northwestern and Michigan. This is a conference where anybody can beat anybody, but Nebraska has to like where it sits right now. Nebraska has another busy week ahead with two midweek games before traveling to Iowa City next weekend. Kansas State comes to Haymarket Park on Tuesday and will try to avenge a 7-0 loss from earlier in the season. First pitch is set for 6:35 p.m. CT.